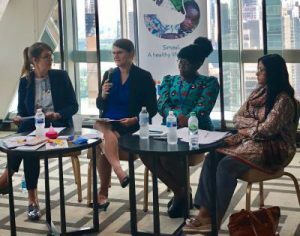 On July 11, 2018, Simavi and WSSCC hosted a panel discussion during the UN’s High-level Political Forum on Sustainable Development, about “Putting Menstrual Health on the 2030 Agenda,” which featured Institute for the Study of Human Rights professor Dr. Inga Winkler as both the keynote speaker and a panelist. Dr. Winkler is director of the Menstrual Health and Gender Justice working group at the Center for the Study of Social Difference at Columbia University. In her keynote address, Dr. Winkler emphasized the importance of removing Menstrual Hygiene Management (MHM) strictly from the Water, Sanitation, and Hygiene (WASH) sector in order to unpack and address issues around menstruation at all levels. She stressed the need to look at the numerous ways that people are affected by menstruation and how menstruation is directly linked to many of the Sustainable Development Goals (SDGs) on the 2030 agenda, such as Good Health and Well-Being, Quality Education, Gender Equality, Clean Water and Sanitation, Decent Work and Economic Growth, and Responsible Consumption and Production. Dr. Winkler stressed the importance of including women and girls in the discussion, especially those who are traditionally marginalized or excluded. The range of experiences individuals have with menstruation should be addressed in order to leave no one behind. For example, indigenous women, women with disabilities, refugee and migrant women and girls, homeless individuals, incarcerated women, and the LGBTQI community all face overlapping forms of discrimination and are often left out of the MHM conversation. Dr. Winkler also noted the large role that religion and culture play in regards to menstrual practices, but that it should remain up to the menstruating individual whether or not to partake in them. In this way these individuals maintain their agency, which is the driving force behind the SDGs. Written by Human Rights graduate students Trisha Maharaj and Tori Miller.